Six days before Donald Trump’s inauguration, a coalition of civil rights groups led by the National Action Network will march to the Martin Luther King Jr. Memorial in Washington, D.C., to remind Trump and Congress that the fight for civil rights continues. On Jan. 14 the Rev. Al Sharpton’s NAN will lead groups including the NAACP, the National Urban League, the National Congress of Black Women, Planned Parenthood Federation of America, the Human Rights Campaign, the National Council of La Raza, Phi Beta Sigma and the Hip Hop Caucus in We Shall Not Be Moved: The March 2017, which will begin at 11 a.m. and travel along D.C.’s Independence Avenue SW to West Potomac Park. At noon, there will be a rally at West Potomac Park, which is located directly across from the MLK Memorial. 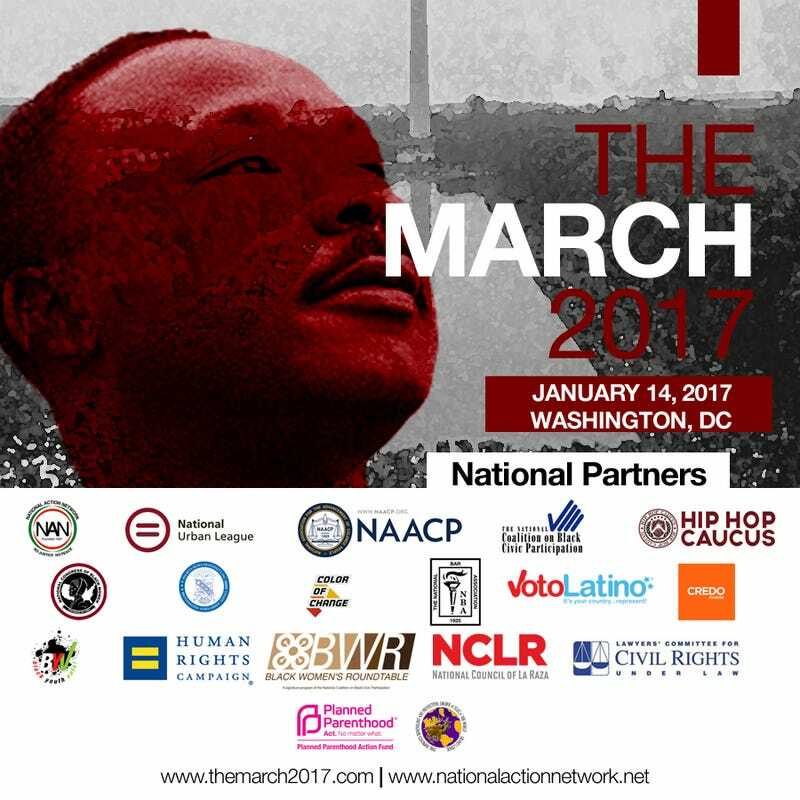 The Martin Luther King Jr. march is an annual event convened by Sharpton, and this year it is more timely than ever. Elected officials who are confirmed to attend include Rep. Sheila Jackson Lee (D-Texas), Sen. Jeff Merkley (D-Ore.), Rep. Brenda Lawrence (D-Mich.) and Sen. Kirsten Gillibrand (D-N.Y.). Participants will demand accountability from Trump and members of Congress who are charged with overseeing the Criminal Justice Reform Act, the Voting Rights Bill, Supreme Court nominations and other Trump political appointments. Amplified on social media by the #WeShallNotBeMoved hashtag, the coalition plan to make their voices heard and send a clear message to those in power that the fight for equal rights and justice for all is far from over. The president-elect’s promises during his campaign have caused concern among civil rights activists. He has vowed to institute a nationwide stop-and-frisk law, further widen the income gap by rolling out more tax cuts for the wealthy and gut the Affordable Care Act, also known as Obamacare. #WeShallNotBeMoved is an opportunity to recommit to the principles of King while taking a stand to ensure access to quality and affordable health care, protect religious freedom and ensure that women maintain the right to choose. For more information or to register, visit the March 2017 website.